If you do not have visibility into who changed what, when and where each change was made, and the current configuration of your systems, it is only a matter of time before your organization suffers a system outage or data breach. With Netwrix Auditor, you get actionable information about every change made across your hybrid environment and can clearly see the current and past configurations of your critical systems. Conducting change auditing and configuration baselining using native tools is an extremely cumbersome and time-consuming process. 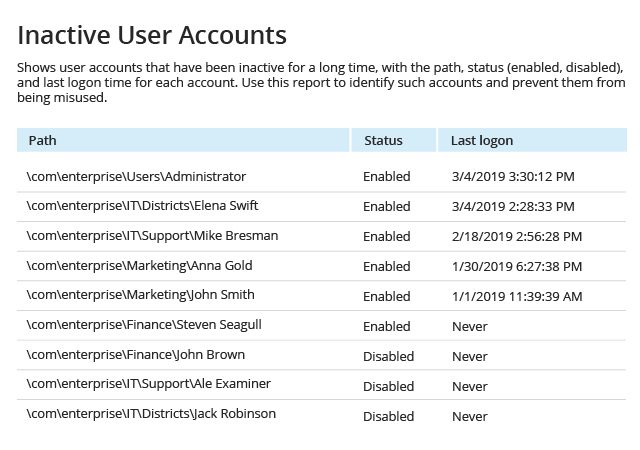 Moreover, it is easy to overlook Group Policy misconfigurations and miss critical events, such as changes to file permissions or user account lockouts. With Netwrix Auditor, you always have all the necessary information at your fingertips to quickly spot suspicious activity and provide the best incident response to prevent sensitive data leaks and prolonged business outages. Without a proper auditing solution, it is almost impossible to determine whether your sensitive files are exposed. 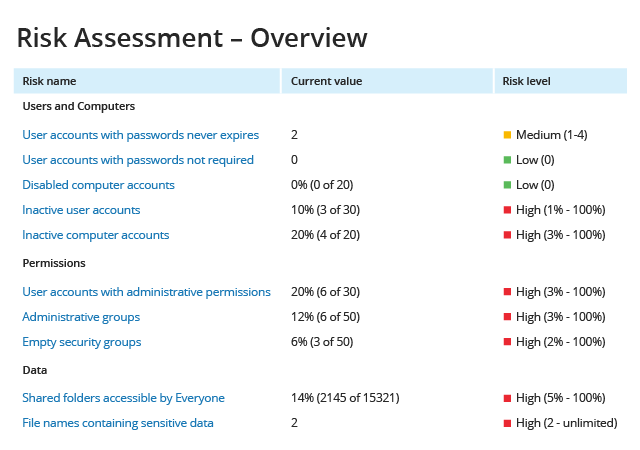 Netwrix Auditor empowers you to identify vulnerabilities that put your data security and business operations at risk, such as shared folders accessible by Everyone or accounts that can access your network without authentication, and ensure that appropriate controls are implemented to rectify those weaknesses. As IT environments increase in complex and new systems are added, management can become a nightmare for administrators. Netwrix Auditor facilitates cleanup of your most critical systems. 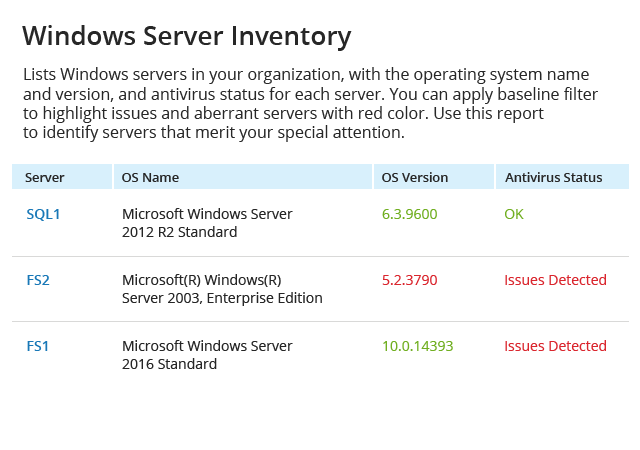 For example, it helps you spot inactive Microsoft Active Directory (AD) user accounts so you can remove them, and makes it a snap to compare the configuration of your Windows servers to a known good baseline so you can remediate any deviations, such as outdated antivirus software. 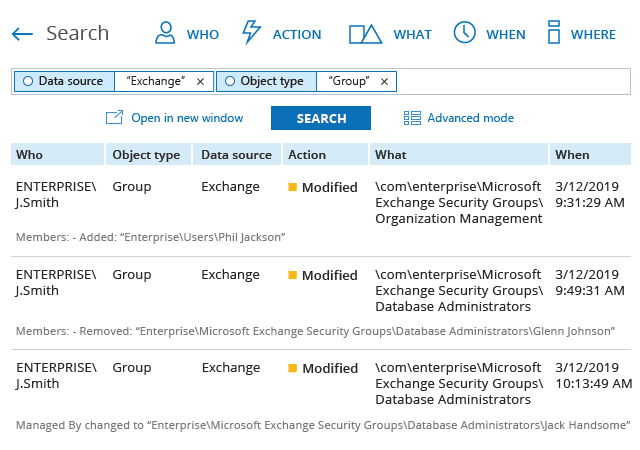 Native logs are extremely noisy and can’t be used to alert you about critical changes, such as the deletion of SQL Server objects or Exchange mailboxes, or changes to organizational units or privileges for accessing sensitive data stored on file servers. 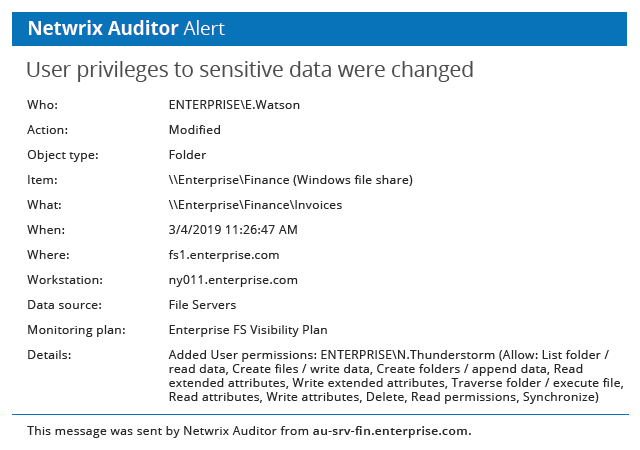 Netwrix Auditor helps you quickly detect external and insider threats by providing detailed audit reports and notifying you about changes that may lead to security incidents. This way, you can promptly implement emergency changes in your infrastructure and mitigate the negative impact of unauthorized changes. Any improper configuration changes in your network can disrupt business processes by rendering employees unable to access company resources and perform their job duties. Netwrix Auditor enables you to improve your change management and quickly get everyone working again by giving you actionable information with all the necessary details, including the before and after values for each change. Compliance auditors often request specific details that can be difficult to extract from native logs. With Netwrix Auditor, you don’t have to spend days compiling reports or spend money on compliance support services. 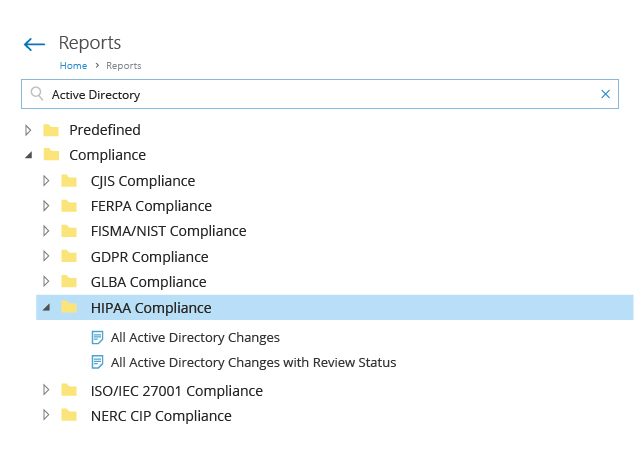 Simply provide audit-ready compliance reports mapped to specific controls of PCI DSS, HIPAA, GDPR and other regulations to easily prove that your environment meets compliance and security standards.